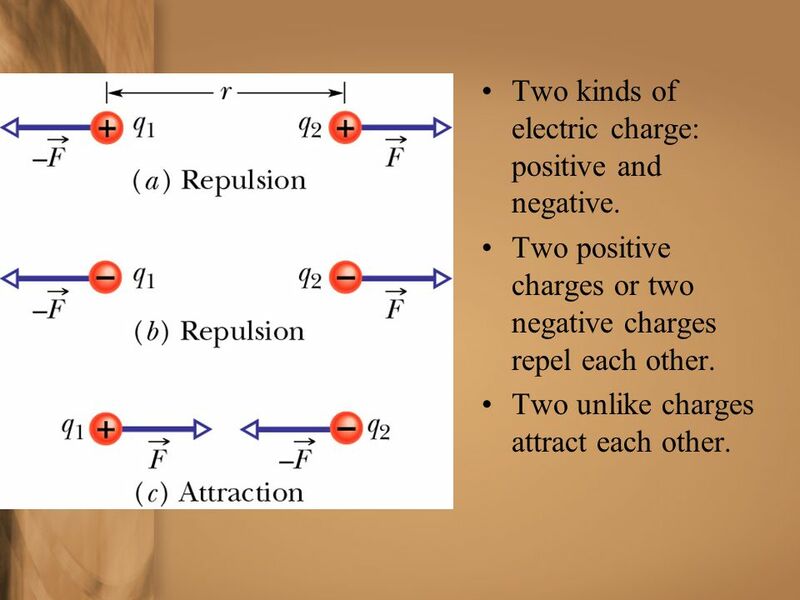 2 Two kinds of electric charge: positive and negative. Two positive charges or two negative charges repel each other. Two unlike charges attract each other. 3 Charge cannot be created, but can be transferred from one object to another – charge is conserved. 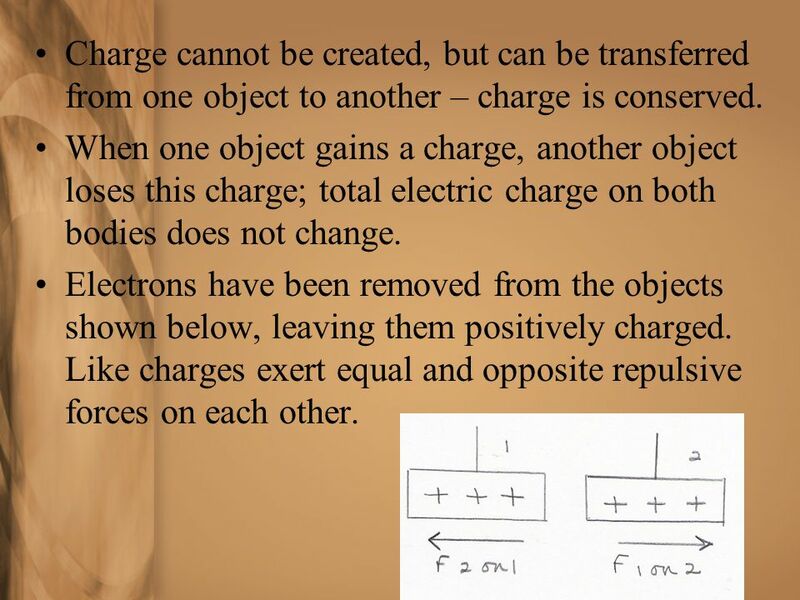 When one object gains a charge, another object loses this charge; total electric charge on both bodies does not change. Electrons have been removed from the objects shown below, leaving them positively charged. Like charges exert equal and opposite repulsive forces on each other. 4 Electrons have been added to these objects, making them negatively charged. Like charges exert equal and opposite repulsive forces on each other. 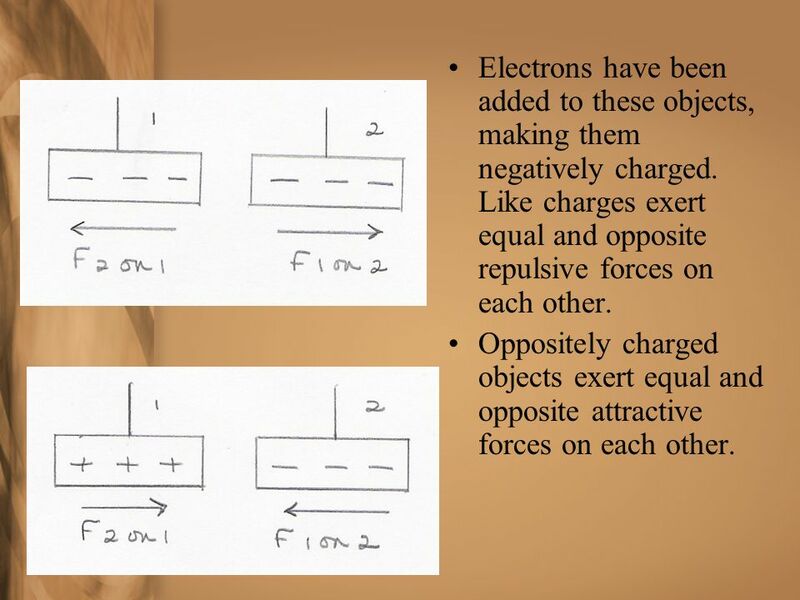 Oppositely charged objects exert equal and opposite attractive forces on each other. 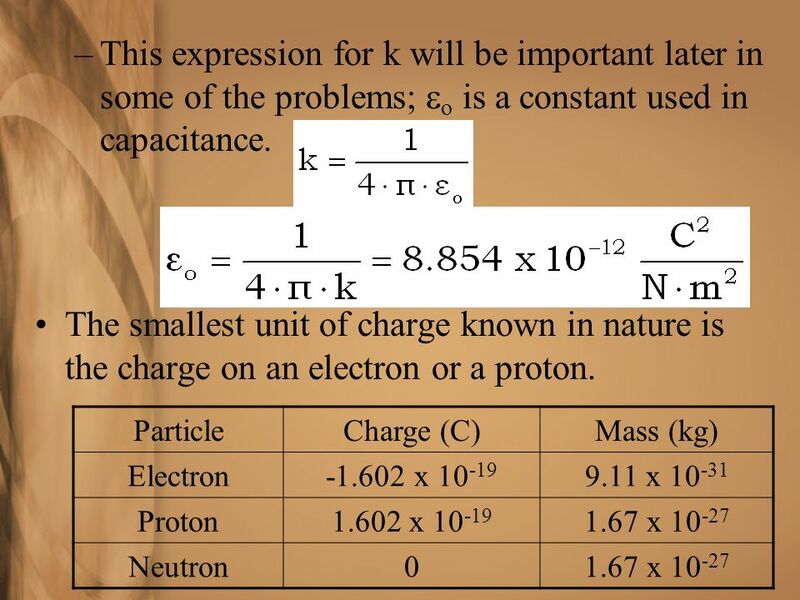 5 All matter has charge; most often the positive charges equal the negative charges and the object has no net charge. More positive charges than negative charges provides a positive charge on the object. 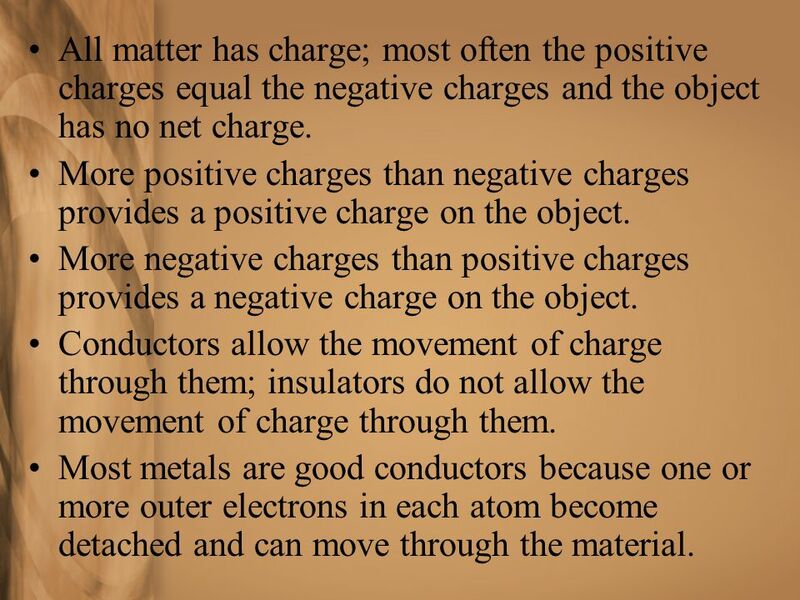 More negative charges than positive charges provides a negative charge on the object. 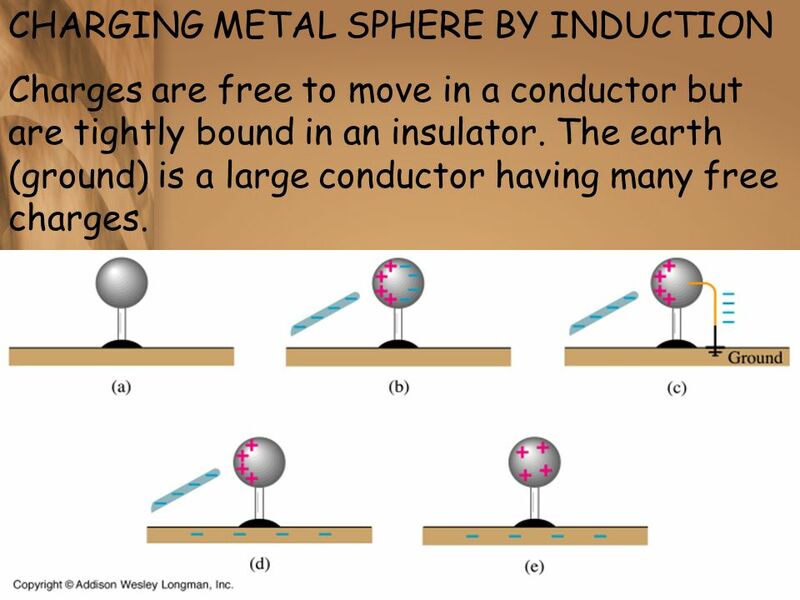 Conductors allow the movement of charge through them; insulators do not allow the movement of charge through them. Most metals are good conductors because one or more outer electrons in each atom become detached and can move through the material. 6 The other electrons remain bound to the positive nuclei, which are bound in fixed positions in the material. Insulators have few, if any, free electrons and electrons cannot move freely through the material. Semi-conductors fall between conductors and insulators in the ability of electrons to move freely through the material. 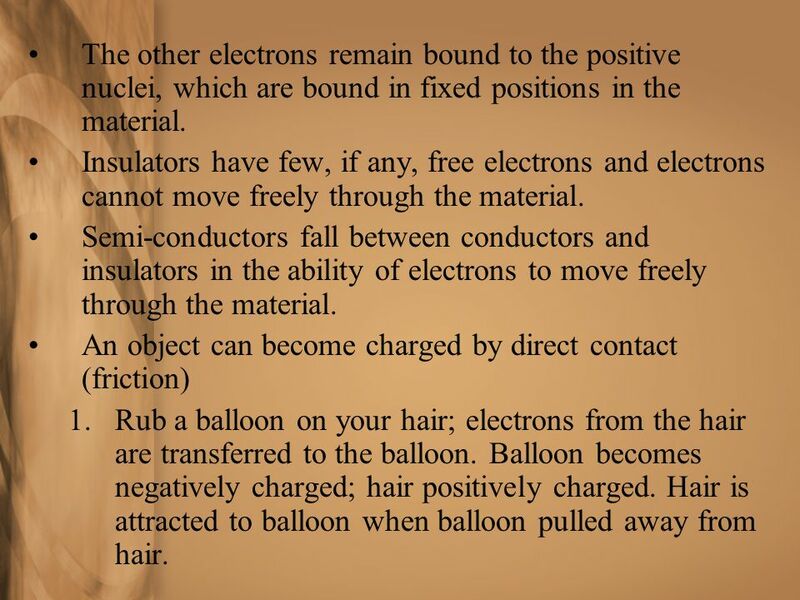 An object can become charged by direct contact (friction) Rub a balloon on your hair; electrons from the hair are transferred to the balloon. Balloon becomes negatively charged; hair positively charged. Hair is attracted to balloon when balloon pulled away from hair. 7 An object can be charged by induction. When walking on carpet, movement of shoes on carpet rubs electrons onto shoes or feet. Charge distributes itself over body and when reach out to touch a metal object, charge moves from you to the metal object (static discharge). An object can be charged by induction. 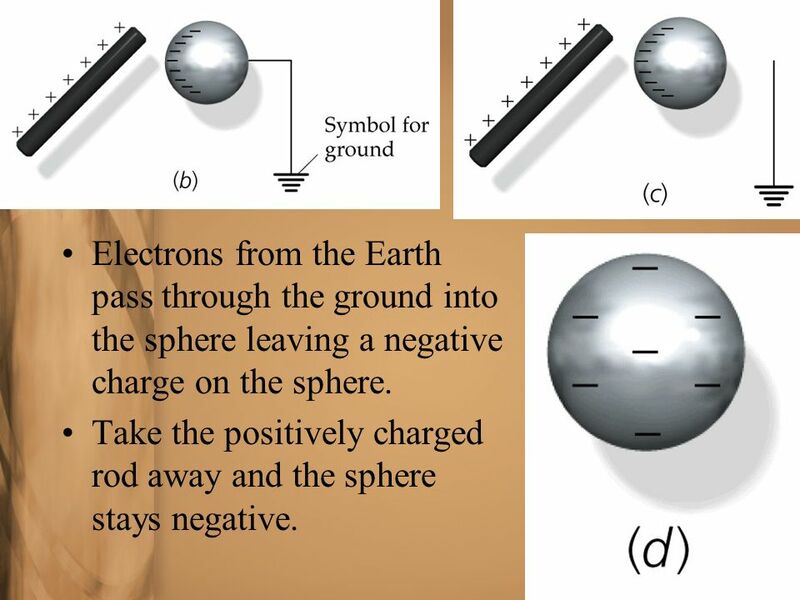 Bring the positively charged rod close to the spheres, but don’t touch the spheres. 8 Negative charges are attracted to the positively charged rod; positive charges are repelled by the positively charged rod. Separating the spheres ensures that the charges remain on the respective sphere. 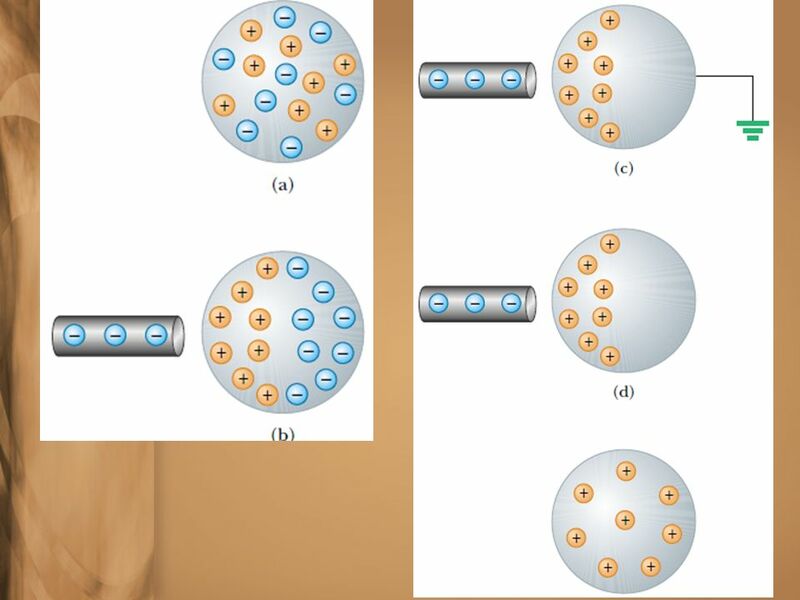 Removing the rod with the spheres separated causes the charges on the sphere to repel and seek an equilibrium position. 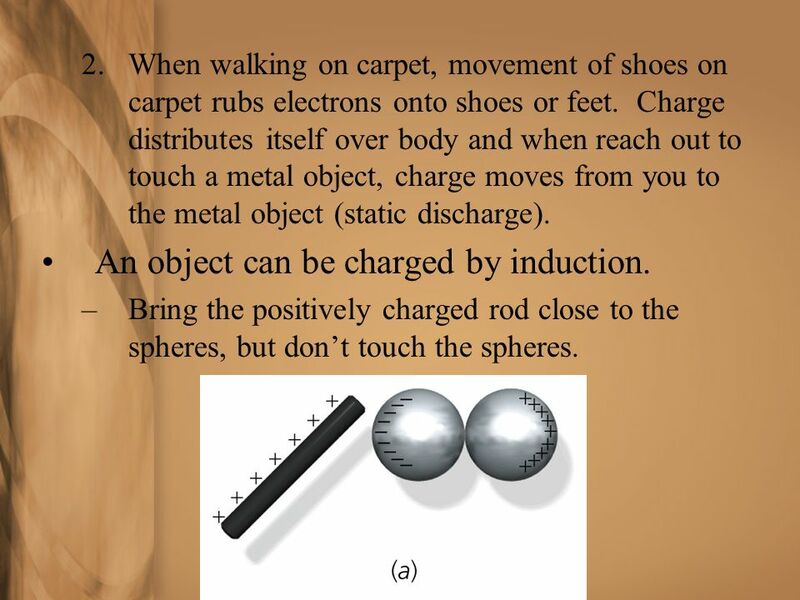 9 Bring the positively charged rod close to the sphere, but don’t touch. 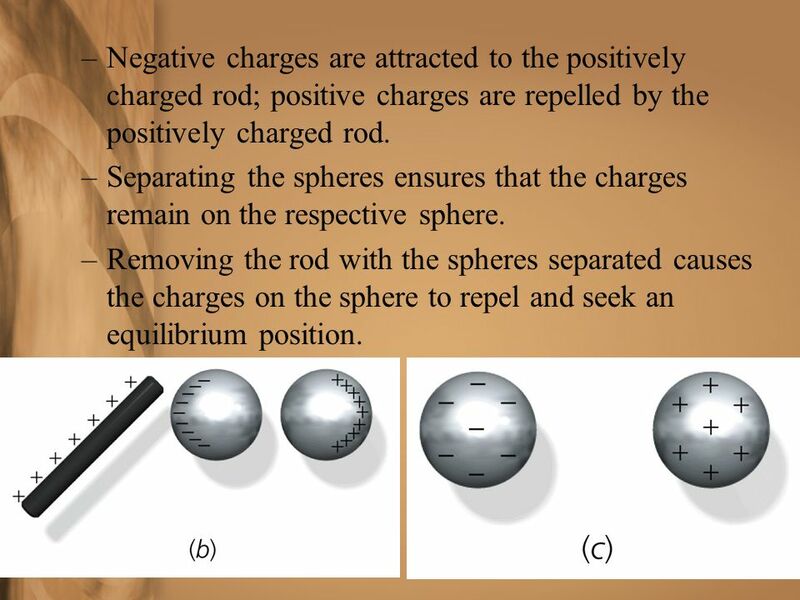 Positively charged rod attracts negative charges on sphere and repels the positive charges on the sphere. The sphere becomes polarized – one side positive and the other side negative. Not all charges move, just enough so that the forces of attraction equals the forces of repulsion. 10 If the positively charged rod is removed, the sphere goes back to being neutral. To keep a charge on the sphere, you can attach a ground to the sphere. A ground is a conducting path between an object and the earth to prevent an electric shock due to excess charge. Earth is a conductor and can act as a source for extra electrons or as a sink for unwanted electrons. 11 Electrons from the Earth pass through the ground into the sphere leaving a negative charge on the sphere. 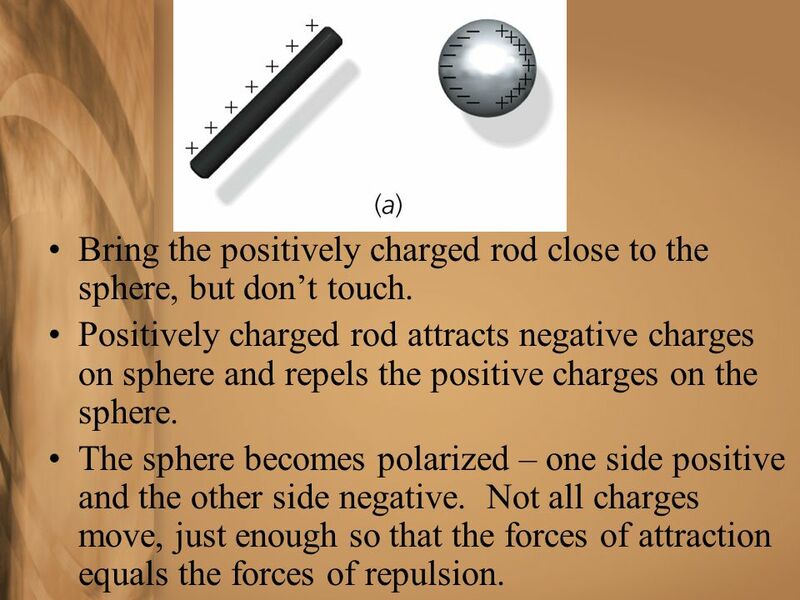 Take the positively charged rod away and the sphere stays negative. 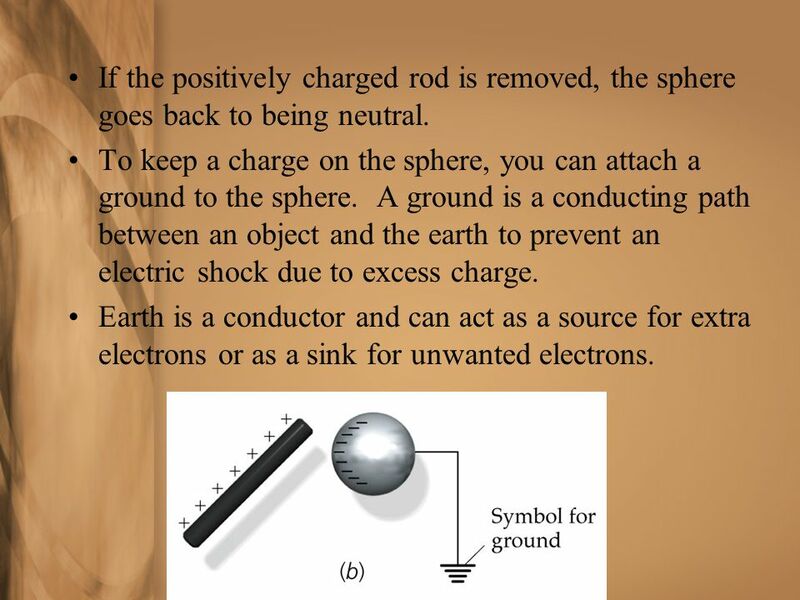 For a positively charged sphere, use a negatively charged rod. When the ground is connected, electrons pass from the sphere to the Earth. In either case, the sphere has been charged by induction. We can’t say what charge is, we an only describe its properties and behavior. Proton and electron carry the same charge q; q = x C. Unit of charge: Coulomb, C. 1 C = total charge of 6.24 x 1018 electrons. 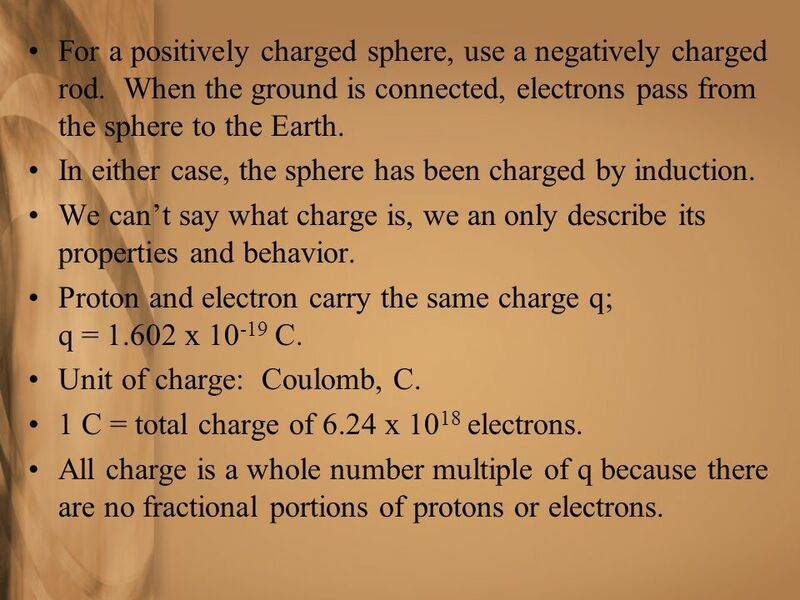 All charge is a whole number multiple of q because there are no fractional portions of protons or electrons. When charge is placed on an insulator, the charge stays where it is placed and does not move at all. 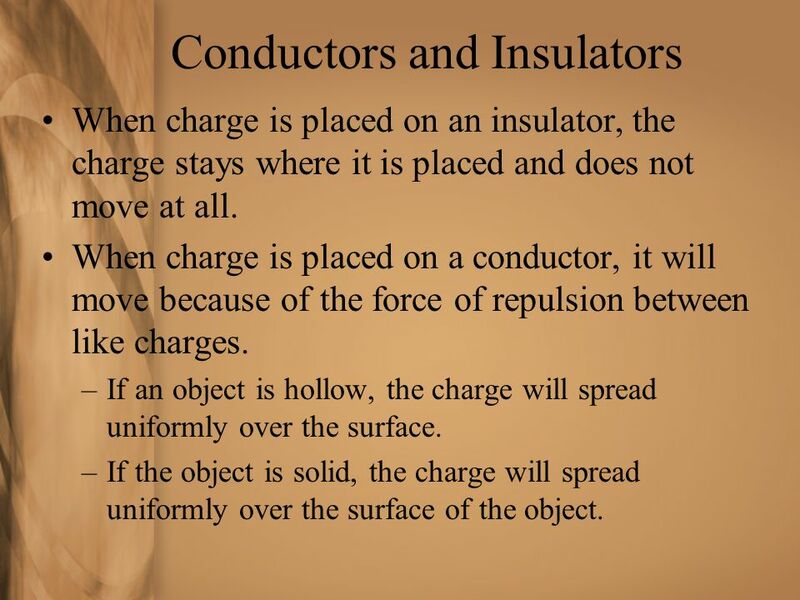 When charge is placed on a conductor, it will move because of the force of repulsion between like charges. If an object is hollow, the charge will spread uniformly over the surface. If the object is solid, the charge will spread uniformly over the surface of the object. 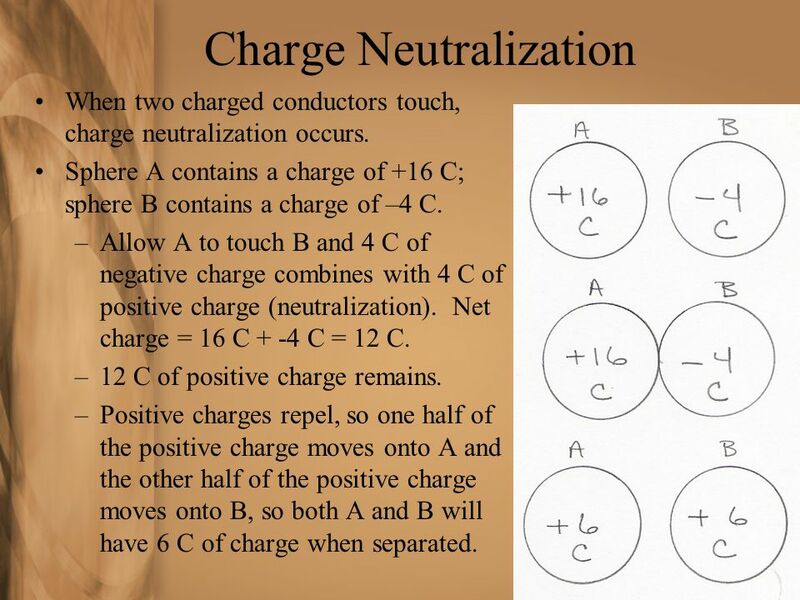 When two charged conductors touch, charge neutralization occurs. Sphere A contains a charge of +16 C; sphere B contains a charge of –4 C. Allow A to touch B and 4 C of negative charge combines with 4 C of positive charge (neutralization). Net charge = 16 C + -4 C = 12 C. 12 C of positive charge remains. Positive charges repel, so one half of the positive charge moves onto A and the other half of the positive charge moves onto B, so both A and B will have 6 C of charge when separated. 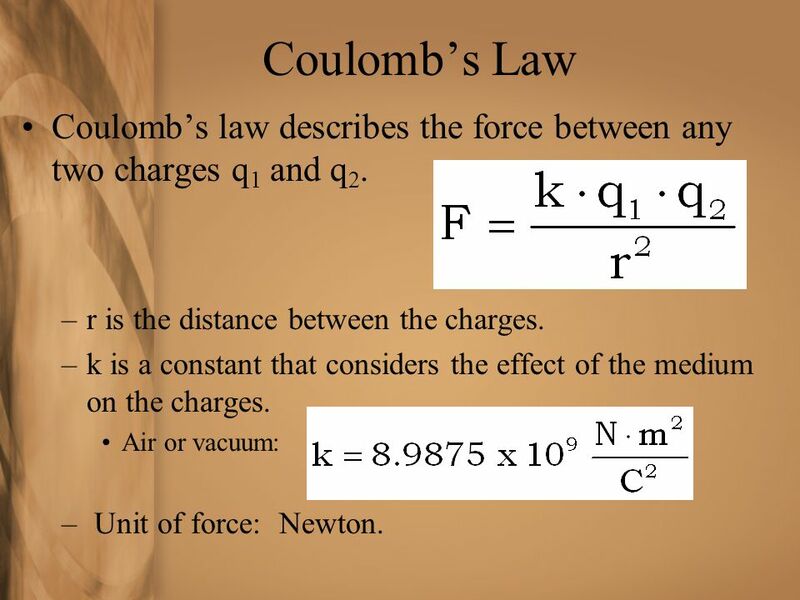 18 Coulomb’s Law Coulomb’s law describes the force between any two charges q1 and q2. r is the distance between the charges. k is a constant that considers the effect of the medium on the charges. Air or vacuum: Unit of force: Newton. 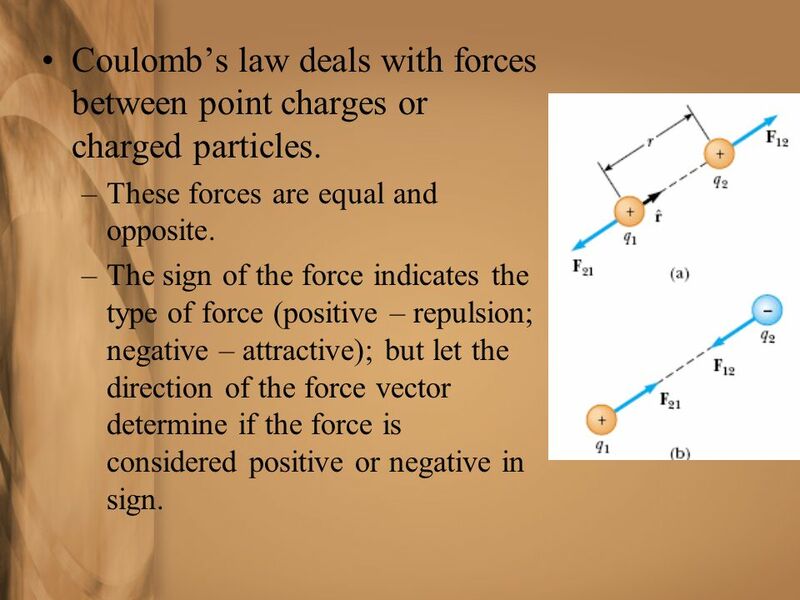 20 Coulomb’s law deals with forces between point charges or charged particles. These forces are equal and opposite. The sign of the force indicates the type of force (positive – repulsion; negative – attractive); but let the direction of the force vector determine if the force is considered positive or negative in sign. 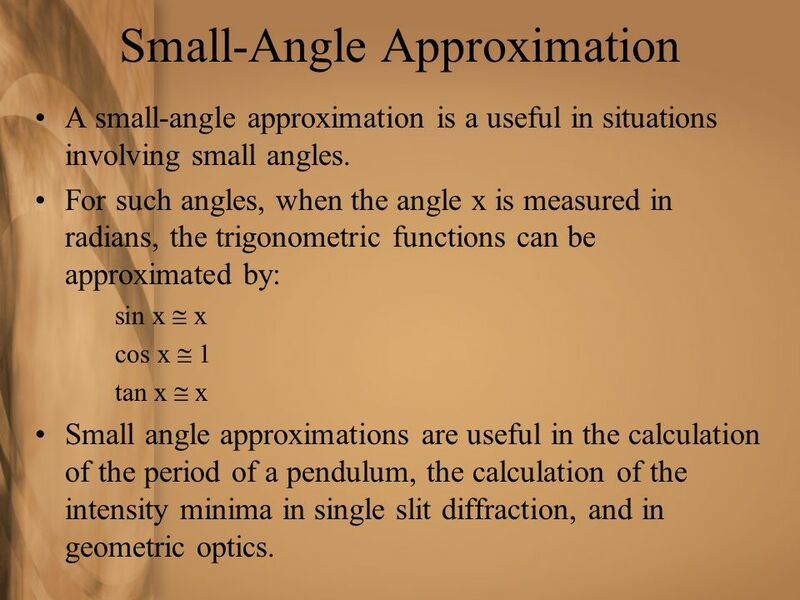 A small-angle approximation is a useful in situations involving small angles. For such angles, when the angle x is measured in radians, the trigonometric functions can be approximated by: sin x  x cos x  1 tan x  x Small angle approximations are useful in the calculation of the period of a pendulum, the calculation of the intensity minima in single slit diffraction, and in geometric optics. Small angle approximation. The value of the small angle X in radians is approximately equal to its tangent. When one angle of a right triangle is small, its hypotenuse is approximately equal in length to the leg adjacent to the small angle, so the cosine is approximately 1. 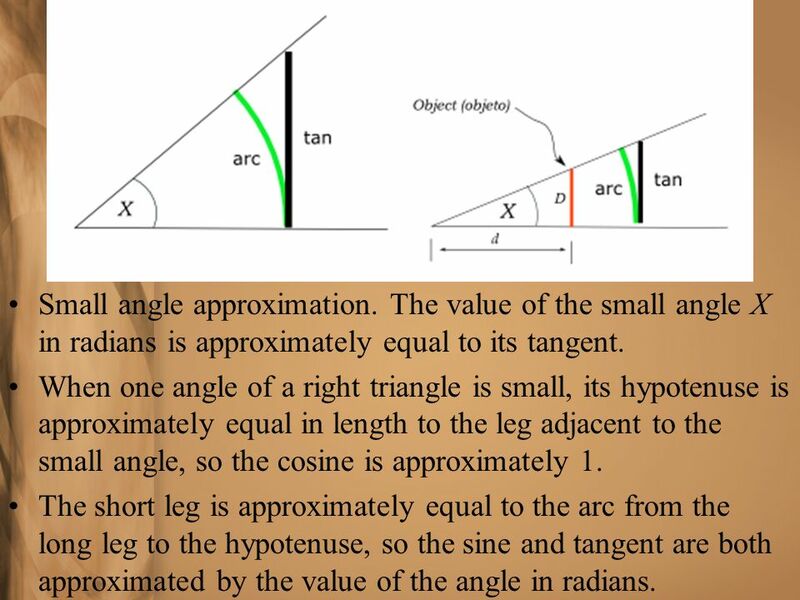 The short leg is approximately equal to the arc from the long leg to the hypotenuse, so the sine and tangent are both approximated by the value of the angle in radians. 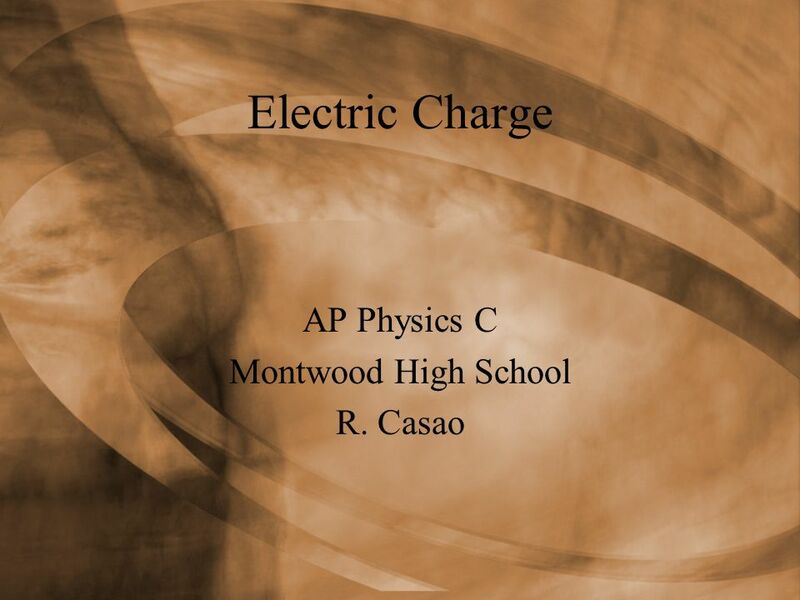 Download ppt "AP Physics C Montwood High School R. Casao"
Chapter 20 Electric Charges, and Forces,. 1 NCEA Physics Electricity and Magnetism. 2 Charging by friction Aims: To be able to describe common materials which are electrical conductors or insulators. 30-Apr-15 Physics 1 (Garcia) SJSU Chapter 22 Electrostatics Part V: Electricity & Magnetism. 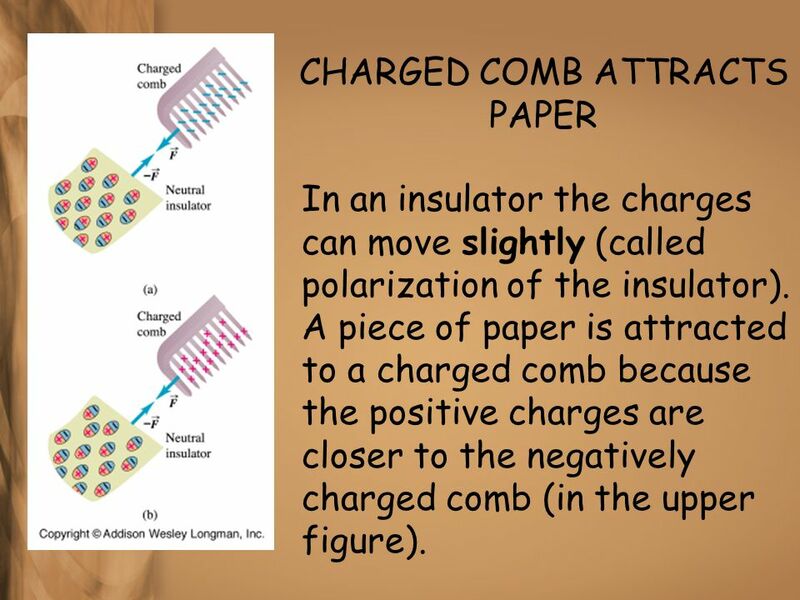 Charge & Coulomb’s Law AP Physics C.
Electrostatics Electrostatics – electricity that does not move or is static All electricity comes from electrical forces from atoms -Atoms contain protons. Electrostatics Deals with electric charges at rest, or static electricity on the surface of an object. Electrostatics Electrostatics The study of electrical charges that can be collected and held in one place. The study of electrical charges that can be. Unit 3 Electricity & Magnetism Electric Fields Physics 5e. Students know charged particles are sources of electric fields and are subject to the forces. Ch 18: Electric Force & Electric Fields. The Origin of Electricity The electrical nature of matter comes from atomic structure Nucleus – made up of protons. Electric Charge and Electric Force. What is an Electric Charge? Protons have positive (+) electric charge Electrons have negative (-) electric charge. Chapter 19 Electric Forces and Electric Fields. 2 19.2 Electric Charges There are two kinds of electric charges Called positive and negative Negative.